If you’re a Massachusetts voter, you almost certainly have found this year’s US Senate seat campaign a puzzling event. Boring, too. That is not what we in Massachusetts expect. We expect and want eloquent, bold, knowledgeable Senators who go to Washington and make a difference, for Massachusetts and the nation. It was that way when Scott Brown faced Elizabeth Warren. It had been that way with Ted Kennedy and with John Kerry, whose resignation to become Secretary of State brought about this year’s election. It had been that way before, all the way back to Daniel Webster and Charles Sumner. Yet here we are, with two candidates each of whose candidacies brings not eloquence or boldness but enigma. About Markey, one has to ask : why is he giving up 37 years seniority in Congress — seniority which is good for Massachusetts — to become an entirely freshman Senator ? In the case of Gabriel Gomez, the Republican, the riddle is, if you’re going to run for such a high office your first time out, why not be bold ? Why not rivet our attention ? Why not have a message or a vision that gives us a reason to reject Ed Markey’s proven competence, and his commitment to agendas most Massachusetts voters support ? Gomez has failed that test. To say the least, Gomez has done no such thing. He has barely said anything at all, and what he has said fits — at best — into the dullest, and sometimes most damaging — his refusal to back an assault weapons ban –of national GOP talking points. Meanwhile, Ed Markey has aid nothing bold either, and his giving up his seniority hurts his own cause as well as our state’s. Still, until 2014, when hopefully our State can finally elect a bold, attention-getting Senator to a next full term, Markey will do a better job of continuing William “Mo” Cowan’s service as our state’s temporary Senator than can Gomez. Markey, at least, has knowledge, commitment, and long relationships with many Senators. No temporary Senator has a better chance than Markey will, of advancing legislation important to the nation’s progress and vital for directing scarce Federal funds to our state’s defense industry and education institutions. 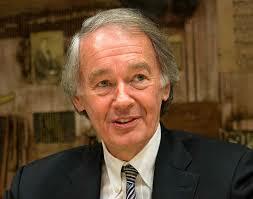 We endorse the election of Ed Markey to the remaining year and a half of this Senate seat’s current term.